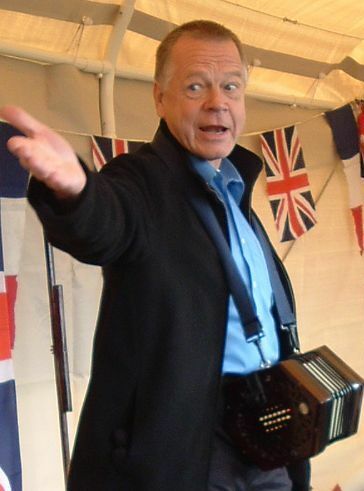 Andy Kenna is a renowned vocalist and musician, singing songs from his native Liverpool, Irish and maritime songs and playing treble and baritone concertina. In 1995 Andy formed ‘Liverpool Forebitter’ with Bernie Davis. The duo recorded two CD’s, one of shanties and forebitters, and one of John Masefield’s sea poems that Andy had set to music. Andy now performs solo, his repetoire of songs, tunes and stories derived from over fifty years of performing traditional music. Andy has performed at all the major maritime festivals in Britain, and also in Holland, France, and even Estonia! In 2009, and again in 2014, he made a successful trip across “the pond” to perform at Portsmouth Maritime Festival, New Hampshire. Contact Andy Kenna to enquire about availability for your concert or festival or for further information.